This ladies t shirt is inspired by one of the best episodes of Dr. Who of all time: ‘Blink’. 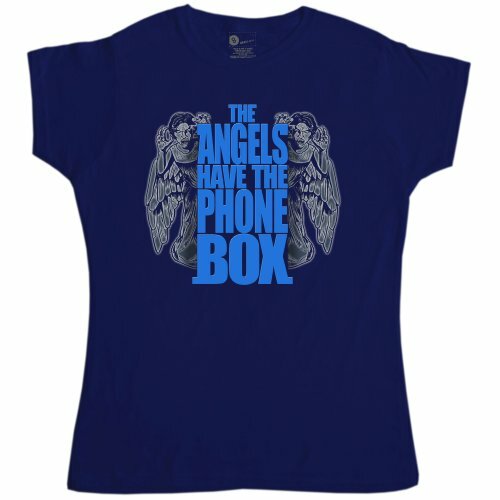 It has the line said by the Doctor: “The Angels have the phone box”, to which Larry muses “I’ve got that on a t-shirt”. Now you can too! The image shows two illustrated Weeping Angels hiding behind the text itself, which is arranged into the silhouette of the TARDIS (the phone box in question). Please note this women’s t shirt design is inspired by the awesome Doctor Who, not officially licensed merchandise. Twin needle stitching on the sleeves and hem for long lasting durability. Check out the 1000’s of t shirts we have available today.